An estate plan should be a flexible, comprehensive plan that considers your needs and desires, and aims for minimization of taxes with an optimal amount of privacy. A will does not encompass these necessities, and therefore does not equate to the same level of protection as having an estate plan. 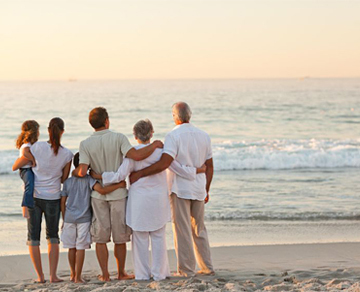 An estate plan begins by protecting you during life. Many people reach a point in their lives when they are unable to make health care or financial decisions for themselves. Identifying and naming proper agents to help with these decisions is not a task that should be taken lightly. When you pass away you have a choice as to who will receive your property and business interests, but these choices need to be made and executed carefully with the right guidance, chosen expressly to help with your specific need. All too frequently, attorneys involved in general practice forget to change the deed for ownership of real estate to the name of a trust, neglect to ask for retirement plan and life insurance ownership and beneficiary designation forms, or keep substantial amount of assets in the name of two parties as “joint” owners. The negative consequences of these seemingly small omissions are very often substantial. They can be devastating to an estate plan, and lead to excessive taxes, improper distributions to certain beneficiaries, increased legal fees, and potential disputes over your estate. If you want an effective and beneficial estate plan, enlist the help of an estate planning attorney with an extensive background in personal finance, real estate law, tax planning and retirement planning, so that he or she can ensure your assets are properly titled, invested in the most tax-advantaged manner possible, and given the proper beneficiary designations. The most effective estate planning occurs while the person is alive and mentally alert. Some estate planning documents may be disputed if executed during a diminished mental state. Additionally, abruptly asking someone to act as your agent immediately after you have been diagnosed with a serious illness may add to an already stressful and emotional situation. The best estate plans allow time for flexibility, evolution, forethought and afterthought. Planning in advance will ultimately save time and money, and help avoid unpleasant surprises. Some people believe that estate planning only affects people upon their death. In reality, creating a truly effective estate plan requires preparing for uncertainties that may occur while you are alive. Documents such as health care proxies, living wills and powers of attorney, gives individuals you chose the power to make health care and financial decisions on your behalf while you are incapacitated. Taking advantage of government benefits such as Medicare and Medicaid requires several years of planning prior to receiving optimal benefits. Additionally, taking full advantage of long-term gifting and charitable giving strategies allows you to minimize income and gift taxes during your life, thereby allowing you to optimize future distributions from your estate. Many questions arise for those who are thoughtful enough to appreciate the significance of the assets that survive them: What are the best ways to leave as much of your estate as possible? How can you help those whom you believe should receive your estate save money on estate and income taxes? Who will take care of your minor children if you die unexpectedly? How can you protect your beneficiaries from creditors and their possible personal weaknesses? Which strategies should you utilize to ensure that your legacy is honored as you desire? What steps should be taken if a beneficiary is a minor at the time of your death? Proper estate planning can be accomplished by correctly utilizing wills, trusts and advanced guardianship directives. Other strategies may include owning certain assets jointly with a spouse or child, creating “TOD” / “POD” / “ITF” accounts, holding property in family limited partnerships (FLPs) or limited liability companies (LLCs), or ensuring beneficiaries are properly designated for your retirement plans.